SAMCO offers a unique Refer and Earn program to its existing clients where in they are rewarded when they refer their friends and family to open an account with Samco. Clients are simply expected to refer a friend or a family to SAMCO securities who are interested to open a DEMAT and a TRADING account. If you have friends or family who still trade with a traditional broker who charges a percentage brokerage and end up paying high brokerages, let them know of the benefits you have received With SAMCO’s Flat Brokerage plan of RS.20/ executed order irrespective of the transaction size. What are the rewards for an existing client when their friend opens an account with SAMCO? When an existing client refers his/her friend or family to SAMCO, they first need to open a Trading Account and a Demat account with SAMCO. Once they open an account they shall get 20 free trades as a welcome gift and for every free trade they consume the client who referred them too gets a free trade. 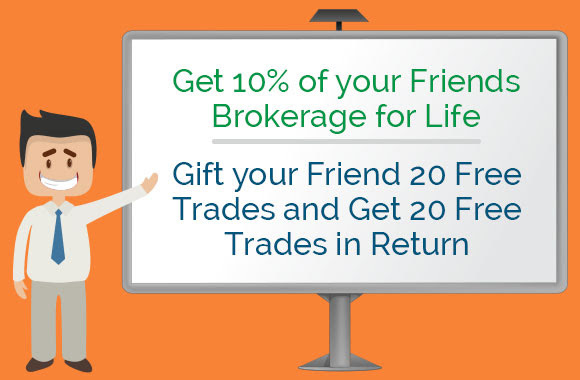 The most rewarding benefit of referring a client to SAMCO is that you get 10% brokerage on the trades made by your referred friend or family member for lifetime. Join India’s only social trading experience and trading competition – The Indian Trading League. Existing clients can refer Via Login in to their SAMCO back office or by visiting the refer and earn page on the website. Read our blog for complete information on the SAMCO Referral Program. How to link an additional savings/current bank account with your Trading and Demat account? How to withdraw funds from your online trading account? How to transfer funds to your Trading account?